L’Atelier de Joël Robuchon is one of five Joël Robuchon restaurants in Tokyo and has two Michelin stars. Chef Robuchon is currently the most-starred chef in the world, and the chance to eat in one of his restaurants, was not to be missed. 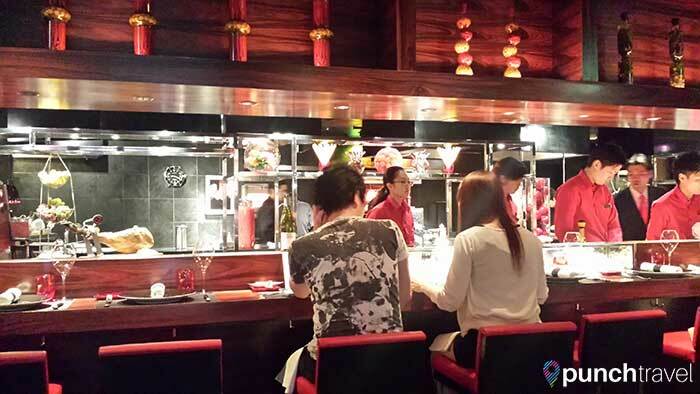 Fun fact: Tokyo has the most Michelin-starred restaurants than any other city. Located on the ground floor of the Mori Tower in Roppongi HIlls, the restaurant decor is inspired by Japan’s sushi counters. The restaurant features an open kitchen with a long counter that seats up to forty diners. From here, you can watch your food being prepared and then served directly to you, just like in the small sushi shops. Even if you are not seated at the counter, the larger high-top tables still provide a glimpse of the action. For dinner, four prix fixe menus are available, ranging from ¥ 5,200 for four courses to ¥ 13,000 for a six course meal. There is also a seasonal menu available for ¥ 165,000. We dined at L’Atelier de Joël Robuchon for a special occasion and selected a prix fixe course with adjustments for the pescatarians in the group. For our meal, we began with a carefully curated amuse bouche. Two bite-sized pork rilletes served on petite toast introduced the dining experience ahead. 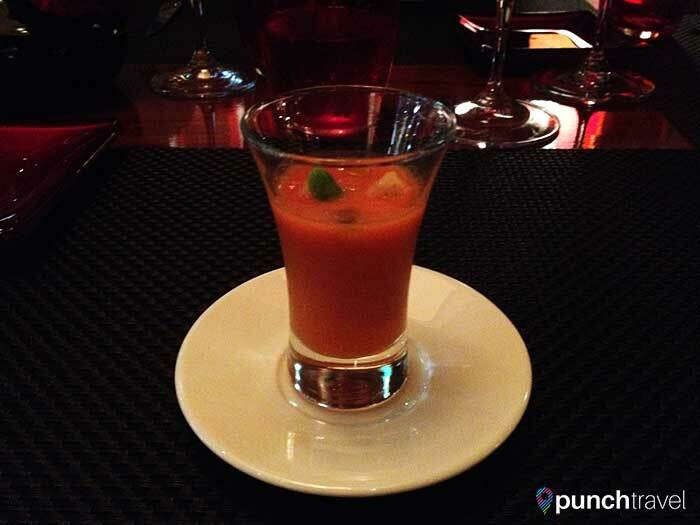 For the pescatarians , they received a shot of chilled tomato gazpacho. The bread basket contained three different types of bread, all homemade by their in-house bakery team. 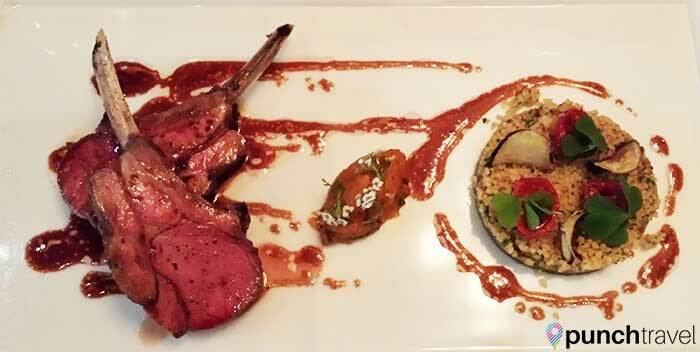 For our entrees, I had Le Carre d’Agneau: roasted lamb served with a harissa flavored pineapple compote and eggplant caviar. The lamb chops were well-seasoned and cooked medium-rare. At the center of the plate, the spicy harissa compote provided a nice kick to accompany the lamb. The eggplant caviar with couscous completed the dish. Matt had Le Saint-Pierre: John-Dory served with a lemongrass emulsion and turmeric oil and tomato. Finished with snow peas and mushrooms, the Asian flavors harmonized nicely with the French technique. 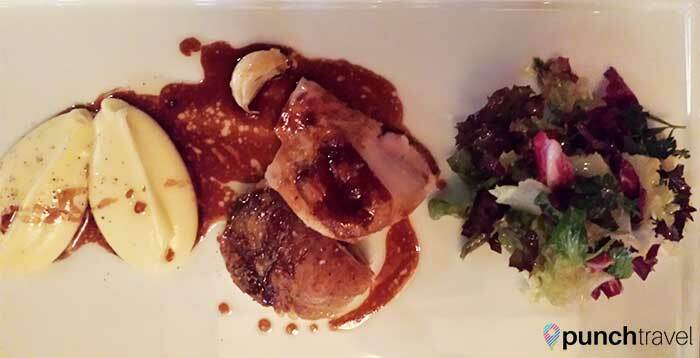 We also sampled the roasted guinea fowl served with a green salad and mashed potatoes. The desserts were the highlight of the meal. Three options are available: La tendance chocolate, le parfum des iles, and le mango-mango. Matt of course, got the chocolate dessert, which was composed of Araguani Chocolate ganache served with a cocoa sherbet covered with bitter biscuit powder. 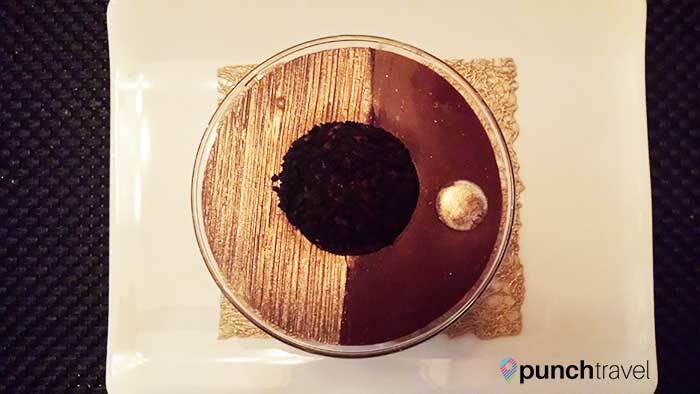 The dessert combined different types of chocolate of different textures for a truly decadent chocolate dish. 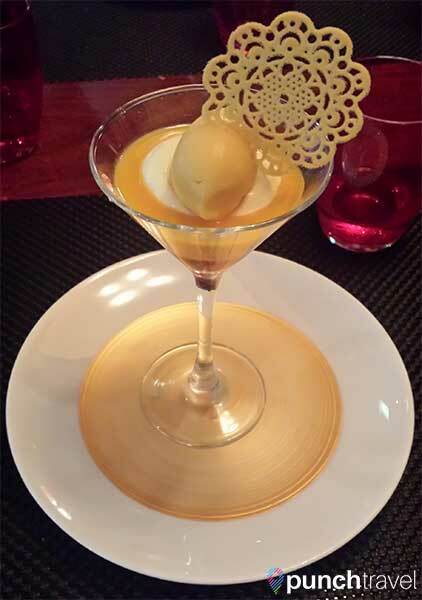 I opted for the mango dessert which was beautifully presented in a martini glass. The base of the dessert was a rose champagne jelly. The next layer was a cranberry gelee topped with a mango mousse and finished with mango sorbet and a finely-crafted wafer. To complete the meal, we received a plate of petit fours (or mignardises, depending on who you ask). These small desserts are bite-sized pastries presented at the end of the meal, accompanied with tea or coffee. There were cannelé, madeleines, jelly candy, cream puffs, chocolate and tartlets. The portions of each course were not large, but we finished the meal fully-satiated and content. The food was absolutely divine. But what really set the meal apart was the impeccable service. I had known that customer service was important in Japan, but this was a level of service that I had never experienced. It all started when we made the reservation a few weeks back. There was a bit of a struggle with the language barrier, and we went away not sure if they understood what we had requested. Despite being late for our reservation (a terrible offense in Japanese culture) we were still well received with the exact table we had selected waiting for us. Throughout the meal, our servers were attentive and anticipated our every need. When it was time to leave, they even presented us each with a souvenir photograph from dinner. If you are looking for fine French-cuisine paired with exceptional Japanese service, consider L’Atelier de Joël Robuchon. The restaurant is open everyday for lunch from 11:30am to 2:30pm (3:30pm on weekends) and for dinner from 6:30pm to 9:30pm.